The following article predates the Russian air strikes in Syria. Its original version was published on September 28, 2015. While explaining the nature of Iranian and Russian military ties with Syria, the article posits that if either the Iranians or the Russians increase their military presence in Syria, they would be doing it to preserve regional stability and keep Syria intact. A lot of negative words have been said about Moscow’s role in the ongoing Syrian crisis by the US and its allies. Starting from August 2015 these claims took a new turn. Reports about Russian military buildup in Syria began. Unsupported by evidence, these reports continued throughout August and September. Some of the reports speculated that Russian effort has been coordinated with Iran. These reports were linked to claims that Qassem Soleimani, the head of the Iranian Quds Force, had visited Russia to discuss a joint Iranian-Russian strategy in Syria. Other reports claimed that Moscow’s moves were aimed at supporting an exhausted Hezbollah and to even rival Iranian influence in Syria. These reports, however, are nothing more than misleading conjecture. Reports that Iran and Russia are competing against each other for influence in Syria are false. 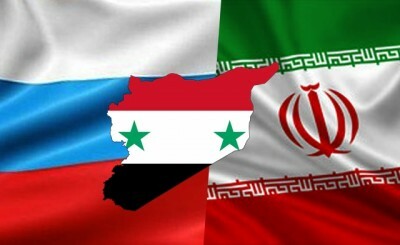 The main objective of both the Iranians and the Russians is to keep Syria intact. Similar to Russian-Chinese cooperation in Eastern Eurasia and Asia-Pacific region, Iran and Russia are collaborating together in the Middle East and the central portion of Eurasia. From the Caspian Sea and the Caucasus to the Levant and the Mediterranean Sea, Tehran and Moscow have been acting as forces of stability. The cooperation between Russia and Iran is on the rise. A three-day long joint naval drill at the northern Iranian port of Anzaili in the Caspian Sea was conducted in August. During the exercise the Russian warships Volgodonsk and Makhachkala trained with the Iranian warships Damavand, Joshan, and Peika. Before this, the last Russo-Iranian exercises in the Caspian were held in October 2014. Throughout 2014 and 2015, Iranian and Russian military officials had high-level communication and meetings. For instance, through the meetings between the defense ministers of the Russian Federation and Iran, Sergei Shoigu and Hussein Dehghan, a principal agreement was achieved on delivery of the S-300 system to Iran. While in Moscow for an international security conference, Hussein Dehghan also suggested a need for a joint Eurasian effort by Iran, Russia, China, and India to counterbalance the US and NATO. Aside from comments by Iranian and Russian officials that Iran is examining a possibility of procurement of Russian passenger jets for Iranian civil aviation needs, there have also been talks about sharing military technology and the joint development of weapons. This includes the joint manufacturing of military jets by Moscow and Tehran. Russia is also going to help Iran develop its own satellite navigation system, which will be linked or based on Russia’s own Global Navigation Satellite System (GLONASS). GLONASS, like China’s BeiDou Navigation Satellite System, is a rival of Washington’s Global Positioning System (GPS). For its part, Iran is planning on exporting its drone technology to Russia. After being prevented by the US and other NATO members from using their airspace to deliver humanitarian cargo to the Syrians, Russia used an alternative route via Iran and Iraq. Unsupported reports soon began to claim that the government in Damascus was on the verge of collapse. Upping the ante, Washington began sounding the alarm bells about a Russian military buildup in Syria that was very much reminiscent of the previous claims about an Iranian military buildup. What is very telling is that in parallel to these unsubstantiated reports, US, British, and French officials were all calling for Iran and Russia to bring the Syrian government to the negotiating table. What does this say about the situation? Moreover, both the Russian and Iranian military presences in Syria have been long-standing. Both Tehran and Moscow have military advisers and technicians inside the Syrian Arab Republic. Russia has a naval base in the Mediterranean port of Tartus, while the Iranians have military defense agreements with Syria. All of this is legal and taking place within the framework of international law. Is there really a Russian or Iranian military intervention in Syria? If either the Iranians or the Russians increase their military presence in Syria, they would be doing it to preserve regional stability. This means not only keeping the Syrian state intact and coming to the aid of a sovereign government defending its people, but also stopping the expansion of groups like Al-Nusra Front, Al-Qaeda, and the misnamed Islamic State – something that the US and its allies have deliberately incubated and fuelled in both Syria and Iraq. If the reports are true that Iran, Syria, Russia, and Iraq are forming an anti-ISIS coalition alongside Lebanon’s Hezbollah (that some Lebanese sources call the 4+1), with the possible inclusion of China, the true intentions of this alliance should be kept in mind.